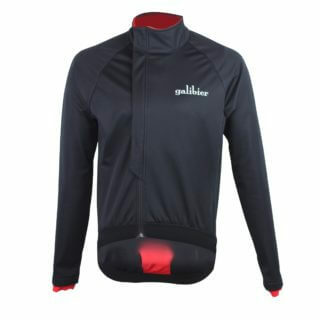 Light, windproof training jacket for use in three seasons. Our Gino jacket, is loaded with features to keep you smiling in saddle time. The wind proof front panels and lined zip, means this jacket out performs it’s light weight. Protecting the rider from the cold north winds of March or fast descents in May. The Double cuff and high neck eliminates all drafts. 3 rear pockets and zipped security pocket hold all your spares and valuables. 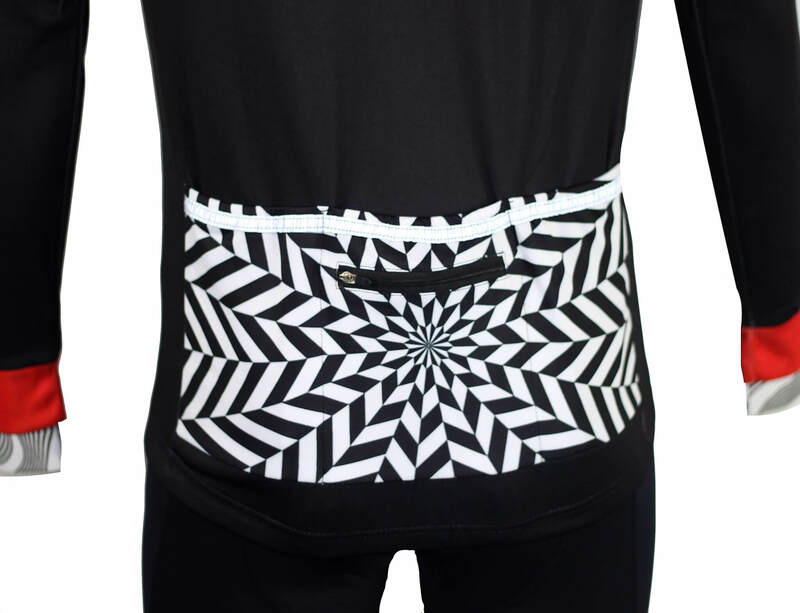 3M reflective strip at the back, accompanied by the bright design keep you stylish and visible. Machine washable and we think, 2 stunning designs into 2019. Currently my go to cycling top. Robust enough to keep out a chill but light enough not to overheat. Ticks all the boxes. Perfect 3 season top with an under layer. Some nice design features on this, very highly recommended. 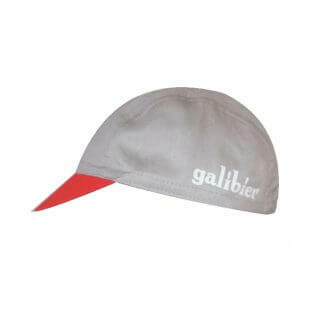 Same old Galibier, always on the mark. This is a high quality, durable windproof jacket which has the ability to be worn as a winter top with a merino base layer. It is also very smart and attracts looks and comments of admiration from my cycling friends. Can repel a light shower and even worn in quite heavy rain I have not felt chilled. Very aero….no flappy bits! Esteticamente stupendo e protegge dall’aria fresca la parte frontale.Si puó usare in molte occasioni o solo con intimo sotto o con intimo e jersey a manica corta.Perfetti gli elastici sui polsi che non fanno entrate l’aria. Se era 10cm più lungo nella parte posteriore era perfetto! Gino Light Wind jacket is exactly what I was after, and was delivered very promptly, thank you. I was looking at winter jackets, but after many reviews claiming that they got too warm above about 12C, and knowing that I rarely get that cold on a ride, I decided to go for something lighter that would see much more action in spring, autumn and cooler summer days, while being able to handle the milder winter outings with a couple of underlayers. This fit the bill perfectly. Two rides in, one dry ride in about 5C with two layers beneath and a second at 6C but with sporadic rain showers with just one baselayer beneath, and the jacket was a consistently even temperature. Up hills, I didn’t need to lower the zip to cool down, and descents were fine. Rain showers didn’t get through, but if its raining at the start of your ride take a waterproof. Washes well so far and looks great. Being 5’9″, 35″ waist, 42″ chest I went for the XL, which was the right size: snug, streamlined & with plenty of movement. Five stars excellent jersey. Great for long rides with a chance of light rain and eliminates the need for the bulk of arm warmers. Torso doesn’t allow a hint of wind through on descents. Double cuff a nice touch and design. Three jerseys in one. Love this jacket.brilliant fit,if it said assos or rapha on the label it would be twice the price.northern Irelands hidden gem. Super nice jacket. Great build quality, great look. I’m consistently super happy with Galibier gear and want to say well done again! The only downside for me is that I was expecting a fit similar to the Mistral Jacket and despite sizing up to an XL it turned out that the sleeves have a different length and are too short (I would say a good 4-5cm) for my super long arms (I’m 6’4″). I don’t really want to return it as the rest is perfect (especially around the chest, shoulders and waist), so I’ll have to figure out something. Great jacket, great for those ‘in-between temperature’ days. On my 55 KM commute I start in chilly weather and arrive in 15 C. This jacket holds up the whole ride. Looks great too. Ordered an L at 182 cm and 84 KG, good snug fit. I’ve worn this as a jersey a couple of times over a base layer and as a jacket over a jersey a few times too. It’s a great fit either way, really does the job at keeping the wind out and it looks cracking. love it,great fit good visibility for blasting the back lanes,all around a winner,keeps the early morning chills at bay.and thank you for the gift.humbled. I have been using this jacket through February, March and now into April and it has proved it’s worth. 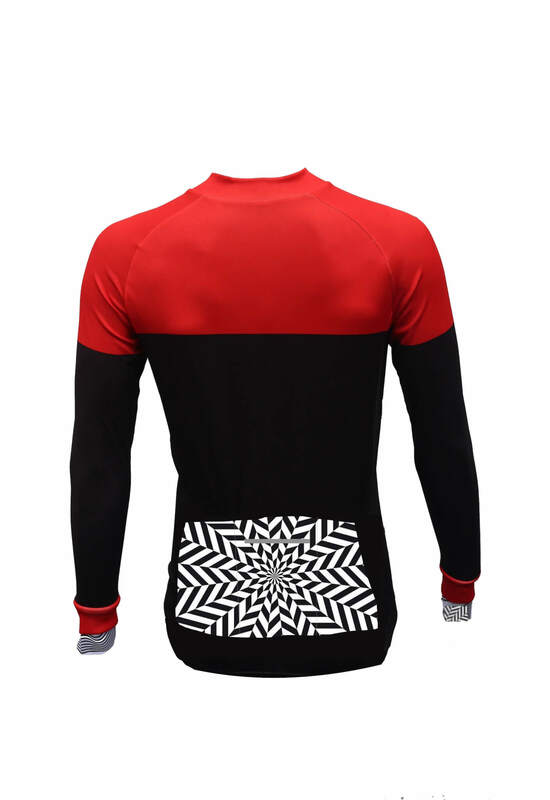 My only dilemma has been long sleeve or short sleeve base layer? I was out this morning – 10C and a stiff NE breeze – perfect with a s/s base. It’s a good close fit, neither flappy nor restrictive – go with the sizing chart. Another good piece of Galibier kit.